Planning the installation of central vacuum systemshould start with the selection of the system itself. Will it be traditional or installation system Hide a hose. Determine which installation space slots (scoops automatic hoses) will be convenient for users, and where to put the central unit of the vacuum cleaner. It is so plan the installation that was led in the simplest and shortest way. Power unit can be placed in the garage, basement, utility room or anywhere else in our house, which is, however, dry and well ventilated. For the comfort it will be good if the selected location is sufficiently distant from the rest of the living quarters to the sound of the engine running was the least audible and annoying. If necessary, the buildings of the central unit in a cabinet or recess should allow the ventilation through proper ventilation holes. Location units must take into account the need to lead the cable outside the building. For aesthetic reasons, you should not plan ejection on the front wall of the building, because the weather conditions cause dirt facade in place of the exhaust outlet. 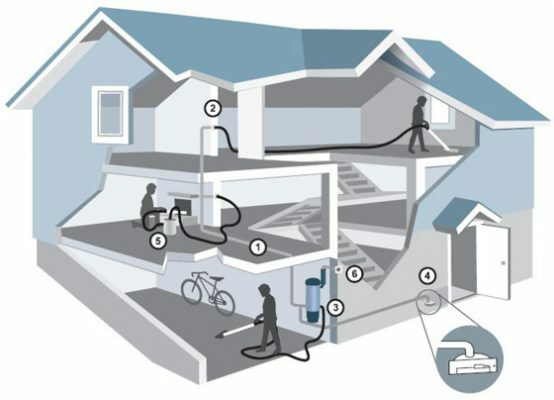 Properly placed suction outlet is the key to proper and convenient use of the central vacuum cleaner. Suction hose must be able to reach every corner of avoiding furniture and other obstacles. The ideal place to put slots are central locations such as corridors and hallways inside the building. Locating slots remember that the longer the hose the higher the flow resistance and less convenience. While the shorter hose to higher installation costs and a greater number of suction sockets. The most common choice for our customers is a hose with a length of 9 meters, because it gives the best value of ergonomics to the cost of installation. Design suction sockets simplest and auxiliary device is a simple tape or string, which can make improvised flexible hose and set suction outlet. At the stage of installation is not necessary to mount the suction slots, because in their place install mounting plates with plugs. They allow you to safely plastered wall sockets around without worrying about their destruction. The cavity plate of the knee and the tube is about 7 cm for worry cram plate in a wall thickness of 12 cm. The plate assemble directly on the side feathers plastered wall with arrows up trying to set it at the perfect level which has a big impact aesthetic later mounted suction socket. We are fixing the mounting plate so that it is flush with the target wall (may be deeper) because the slots have a certain tolerance for installation as well as we have an extension in the event of a deeper happily integrate the plate. Frequently scoops automatically are installed in kitchens, dining rooms and hallways of furniture pedestals and cabinets. At the stage of installation of no common approach because the above mentioned devices are connected to flexible hose installation. The exception is the scoop mounted in the walls, which are used in special mounting boxes LEOVAC. Standard dustpan to derive approx. 20 cm vertical pipe from the floor at a distance of 20 – 30 cm from the wall at the site of the planned scoops. In place of scoops kitchen, we can offer a special cassette Vroom retractable hose. However, in place of scoops Hall we suggest WallyFlex. When planning the installation, keep in mind that the less hydraulic resistance of the plant will be more efficient and cheaper to produce. We should therefore strive to lead the shortest possible installation sections, laying pipe along a straight line as possible with numerous bends and kinks. To perform the installation using only mild fittings (bends 90 °, 45 ° elbow, elbow 30 °, tee 90 °, 45 ° tee, connectors, tee 2 × 90 °). Short elbows 90 ° and 90 ° tees sharp use to connect to the plate. Any obstacles encountered on the path of the pipeline are trying to pass the top and not the bottom with 45 ° bends. All branches (tees) installation is performed in the horizontal plane (never from the bottom) in order to avoid inheritance gravity.